Piedmont is located in the far North West of Italy and is one of the major Italian wine regions. It has been party to the recent success of Italian export wine and with new and improving viticulture techniques; Piedmont producers have been able to improve upon already great existing products that were previously enjoyed only by the home market. Wines in Piedmont are often named after the region or appellation control area where the grapes were grown (similar to the French, Spanish and German systems). However, in a move that makes Italian wines a little easier to identify once you have some knowledge of the grape varieties, many wines are named using a combination of grape variety and region. On the other hand, some wine names seem to fly in the face of any convention at all, but this tends not to be true of the DOC wines (those wines certified as coming from a specific region). Piedmont is chiefly associated with high quality red wines made principally from the Barbera, Dolcetto and Nebbiolo grapes. The best known of these reds are the Barolo and Barbaresco wines made from the Nebbiolo grape. Nebbiolo produces full bodied reds with gritty flavours. 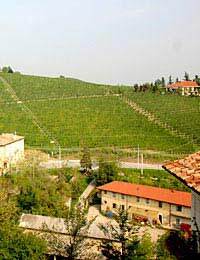 In the case of both Barolo and Barbaresco, terroir is thought to be essential to production. This is something unique to the Piedmont regions, as no other region is so concerned with the specific attributes of separate vineyards and estates. Barolo and Barbaresco wines are made chiefly in Langhe, the most renowned of the Piedmont growing departments. Another well respected red is ‘Dolcetto’, grown in Alba and Asti. Dolcetto is dry and light with a high acid and tannic taste, ideal for cutting through heavy pasta and dough based dishes. In Asti, as well as Monferrato, the Barbera grape, which is dark in colour, sometimes slightly sparkling and high in acid, again ideal for searing across heavy dishes. Interesting white wines are also produced, although Piedmont is often associated with poor sparkling and semi sparkling varieties. This is due in part to the demands of the export market, met with frothy party wines made from the sweet Moscato Bianco grape. Cortese, grown in Gavi and Arneis, grown in Roero are just two of the exceptions to the accepted rule that Piedmont is solely a producer of quality reds. This perception looks set to change the more the Italian wine market opens up to the world. Barolo Cerretta 2001: Ettore Germano is an intense red wine, with aromas of ripe fruit and vanilla and a spicy full bodied flavour. Barolo Cerreta is perfect with "Tartufo d'Alba" mushrooms – a selection of mushrooms from Alba – a small city in Piedmont. It also goes well with fondue. Nebbiolo D'Alba Ochetti 2001: Nebbiolo d'Alba is a good example of a “minor” wine, which although very cheap are often high in quality. An intense red wine, with aromas of cherry and fruits, it is ideally paired with ‘Brasato’: beef browned with vegetables and spices, cooked in red wine.